By virtue of their SEC titles in ’59, ’61 and ’62, Mississippi State University received invitations to play in the NCAA tournament each year for the men’s collegiate basketball championship. Each time, the invitation was declined. Until March, 1963. What followed was a story of courage, political intrigue and danger in the depths of the Jim Crow south. 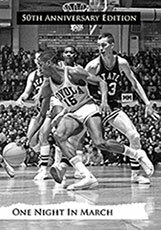 This is the story of the 1963 Mississippi State University basketball team and their historic game of change against Loyola (IL). Order a copy of the extended edition of this award-winning documentary. “One Night in March” is available in a 39-minute extended edition on DVD or Blu-ray. Order securely via PayPal or call 1-662-324-2489 (M-F, 8a-5P CST) to place your order today. Select either DVD or Blu-ray. Watch “One Night in March” on public televisions stations across the country. Check your local listings for airtime’s at www.APTonline.org.